Buckle up kids, this is a long post that is mostly about paint. I know, you’re already on the edge of your seat. As you may have heard, we are having a very long winter here on the east coast. This does not please me, but it has allowed me extra time to work on my official winter project, the stairway, and I have needed it. Between travel and work I have lost a good number of weekends, and then there’s been one other hiccup; I could not for the life of me find the perfect grey wall color. Grey has been such a hot color in decorating over the last couple of years and there is a lot of advice and photos out there about great greys, so I am super surprised that I had this much trouble. I started looking at swatches in December I think. And after taping a bunch to the wall and living with them for a while, I narrowed my choices down to a few swatches near each other on the color wheel. Then, over President’s Weekend I decided to paint over the current tan color that was on the wall with white so that I could try out swatches on a neutral background. Since I have a good amount of BM’s Simply White on hand, I just decided to use that instead of springing for a can of primer. I wanted a “true” grey so I looked for colors that deepened to a deep charcoal or black on the swatch strip. 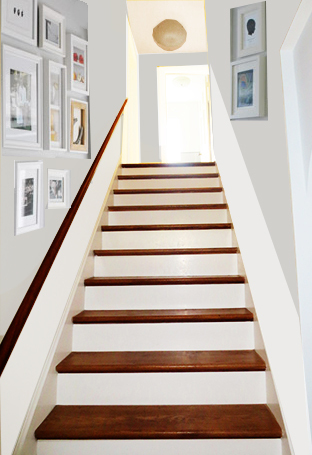 I also want a light color, like a silver, since the entry and stairway don’t get that much light. My first choice was Marilyn’s Dress by Benjamin Moore. 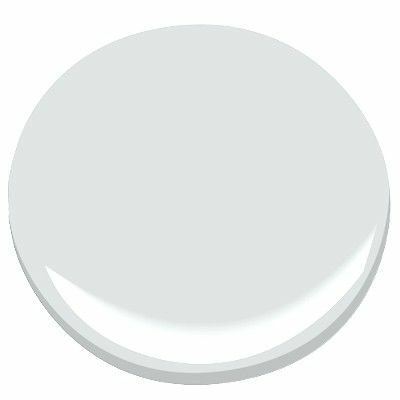 I thought it was just the light, silver color I was looking for, but it reality it was too light and it didn’t contrast enough with the simply white trim. Next I tried Sweet Innocence, Grey Timberwolf, and Silver Half Dollar all by BM as well as Pebble Grey by Glidden. In addition all of them being darker than I wanted, the sweet innocence was too purple, the Grey Timberwolf was too blue, and Pebble Grey was too brown/clay. *Sigh* This was starting to get annoying, and expensive. But I forged on as my hope is to carry this color into our master bedroom so I really wanted to love it. I actually really liked the tone of Silver Half Dollar, but like the others, it just seemed to dark for the space. I knew that you can “half tint” a color by mixing it with white. In fact the tan color that was previously on this wall is a half tint of BM’s Berber White. So here’s what I did. I took a red solo cup and put it on my little kitchen scale and added about 2 oz. of the Silver Half Dollar paint and about 2 oz. of Simply White. Then I mixed them together using a straw and put a sample of this color on the wall right above the full tint sample. I did the same with Grey Timberwolf since that was Mark’s favorite. I liked the half tint of the Silver Half Dollar the best so last Saturday I bit the bullet and purchased a gallon in half tint. Before we started painting the walls, however, we marked where we wanted the chair rail to go. As you can see in this inspiration picture, the chair rail will be about 1/3 of the wall. After researching standard chair rail height, we settled on 34”. 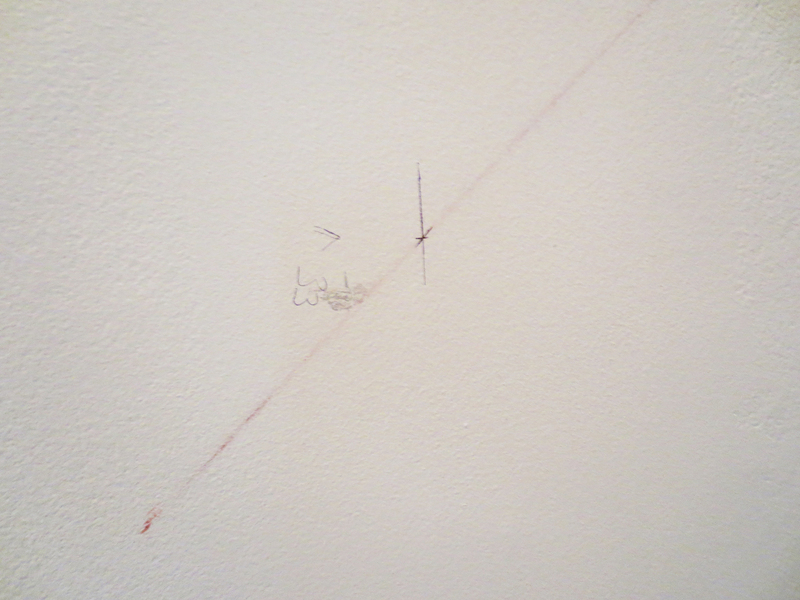 We marked the height at both the top and bottom of the stairs and then snapped a chalk line to get the angle. Once that was done we got to painting. It took two coats and when we were done it looked like this. After living with it for almost a week, I am pleased to say that I really like the color. It’s that nice, light silver color that I was looking for with enough depth to contrast nicely with the white trim and eventual chair rail. Here is a picture of what it looks like at the top of the stairs in the little hallway. Our next steps are obviously to finish the chair rail and start the frame wall. We also need to do something about the banister and hand rail. We tried to stain them to match the floors and it didn’t turn out so good. I will have a post on that soon. What’s up party people? It’s been a busy month around these parts with things other than home improvement. 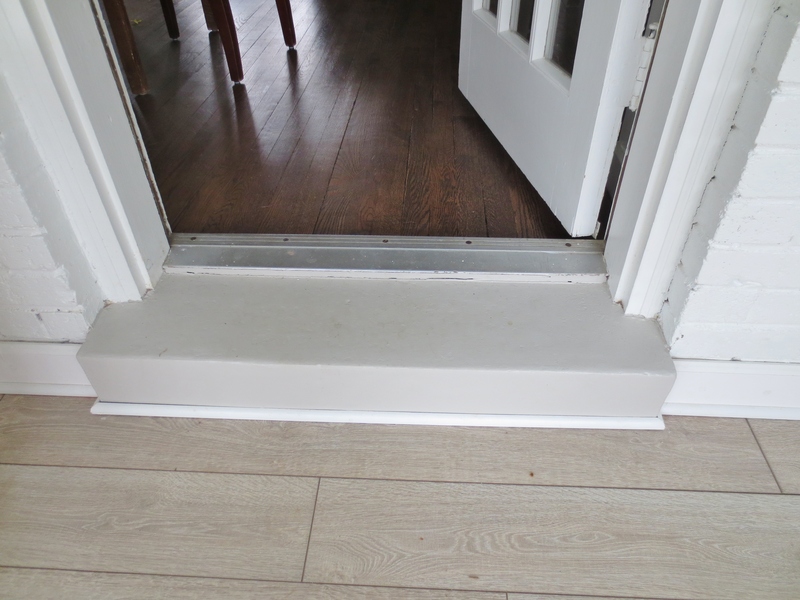 We haven’t finished any major projects since we got the floor down in the sun room, but this post will update ya on a couple of smaller things that we have be working on. This first update is actually from last fall. 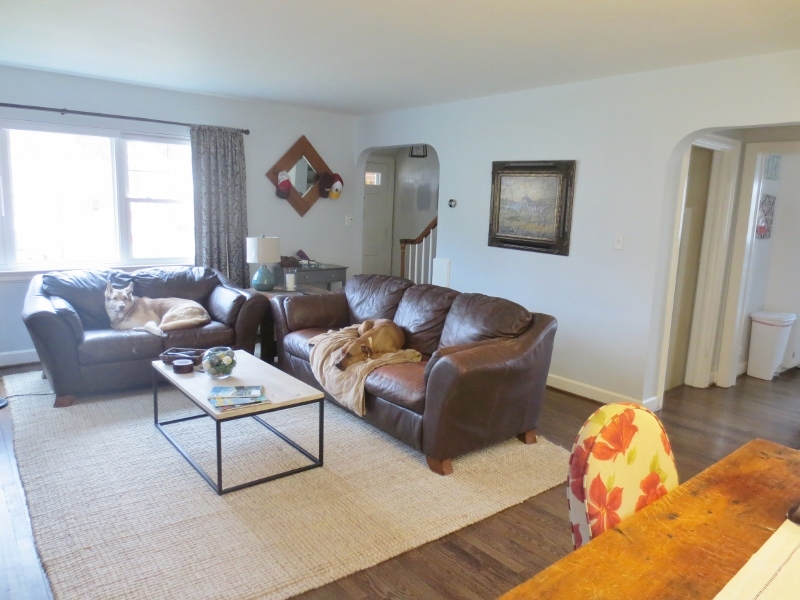 When we re-finished the woods floors in the house, we took the opportunity to upgrade the rug and coffee table in the family room. This is what that space looked like before. And here is a view of that space now. 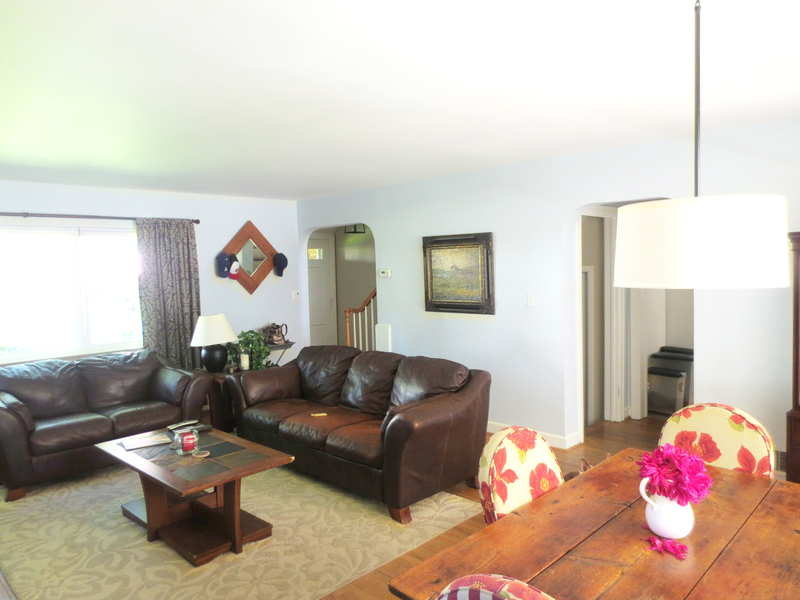 The coffee table is from West Elm and the rug is from Pottery Barn, but it is not on their website anymore. I looked for a long time for a table with a light top and non-wood base. Ideally it would have also had a lower shelf, but I couldn’t find one that had one that I liked. I figure I can always add a basket or something under the table if I want more storage, but after using it for over 6 months, so far, I haven’t wanted it. 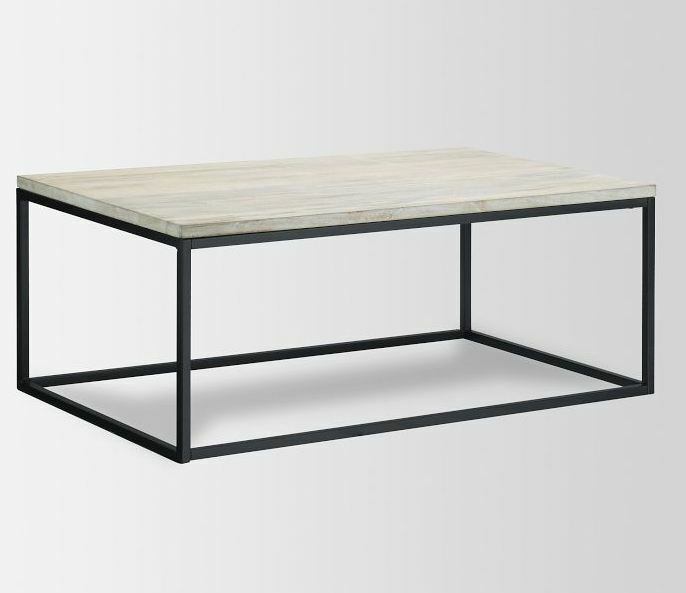 I like that it’s a bit more modern looking than our old coffee table and so far we haven’t had any issues with the unfinished mango wood top. We have spilled liquid on it once or twice (nothing dark) and wiped it up right away each time. When the wood dried, there was no stain. We are still considering trying to apply some type of sealant for extra piece of mind, but haven’t pulled the trigger yet. The next update is the start of what I previously alluded to as my “winter project.” Even though it is March 16 and this project still isn’t complete, I don’t feel defeated because it’s still snowing here in NoVa and snow=winter so I haven’t failed yet in my book. 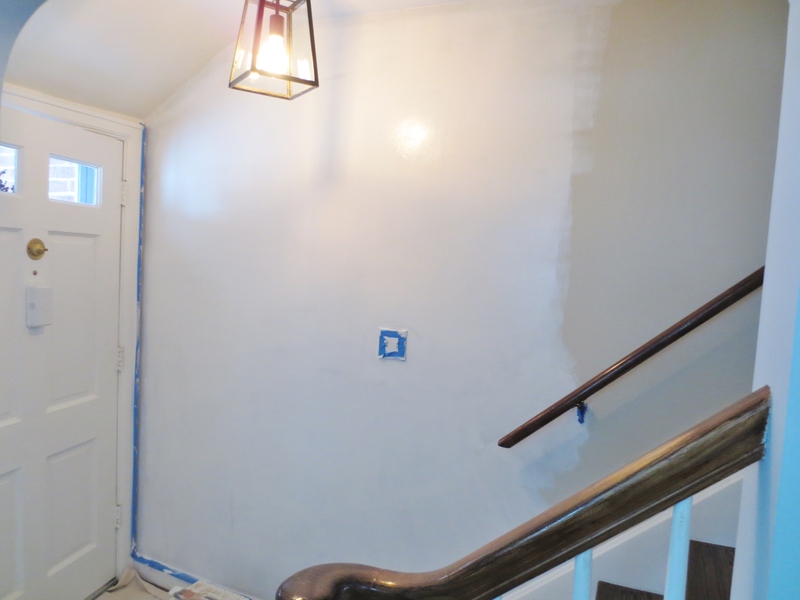 Over President’s Weekend I took the first step in jazzing up our entry/stairway by painting over the tan wall paint in preparation for a new light grey/silver color. Instead of buying a gallon of primer, I thought I would just use white paint since I have a bunch of it from the sun room walls. Here is what the project looked like about 1/4 of the way through. I did two coats which was enough to cover the tan paint, but you would need three if you weren’t going to just paint over it. This project has slogged along since then because I am having a really hard time finding the perfect shade of grey. Once I find the right one, I will have a whole post on that bag of drama. But for now we move on. 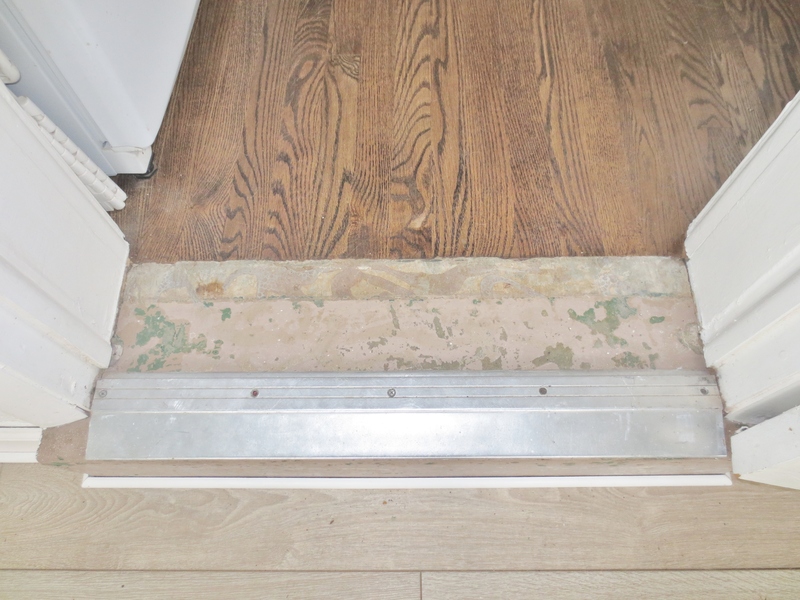 The last little update is the concrete steps that lead from the house to the sun room. They were bad shape. 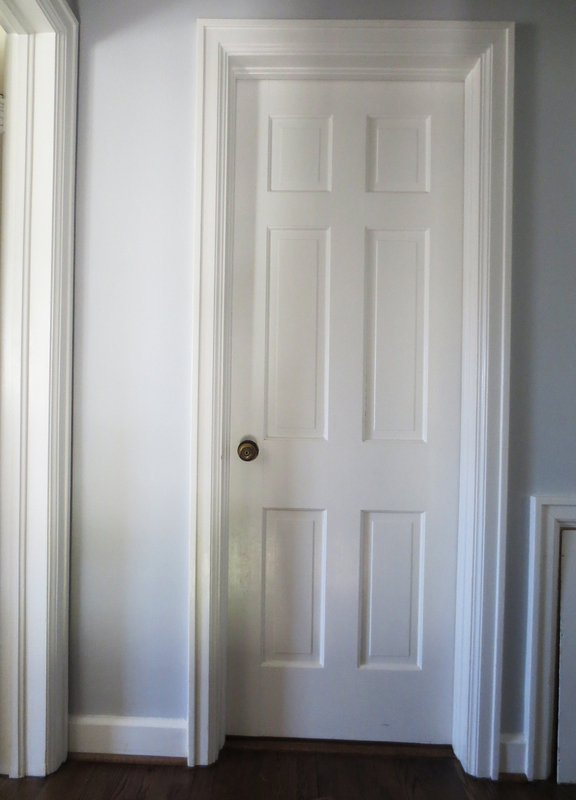 But after a little sanding a three coats of concrete paint in Anew Grey by Sherwin Williams, it is looking like this. Much better, no? 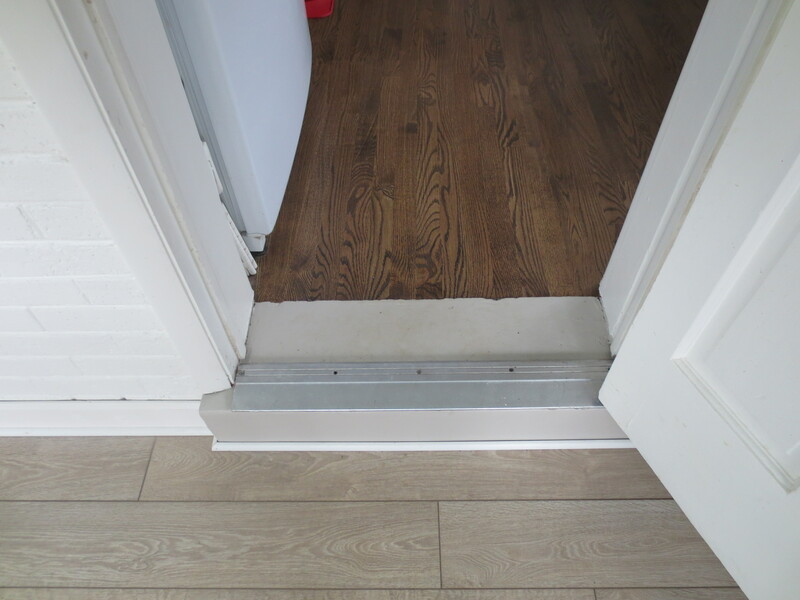 Here is the view of the other step. So that’s the 411 on some smaller projects we have tackled in the last 6 months or so. 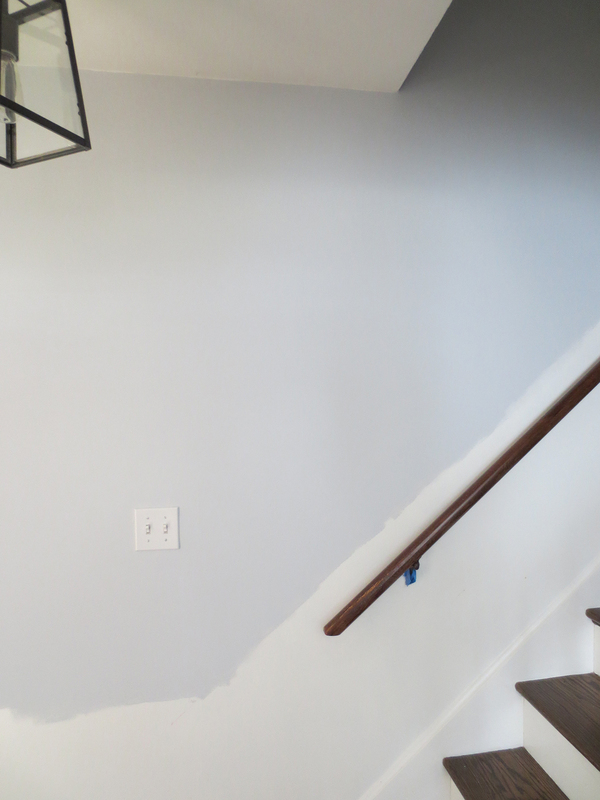 Our next project is finally finishing the entry/stairway as soon as I can settle on a paint color. Hopefully I will be back next week with an update on that.